MPUMALANGA, SOUTH AFRICA: Twenty-six people were killed in South Africa on Friday when a goods train ploughed into a truck carrying farm workers at a level crossing, officials said, raising an earlier toll. The train transporting coal to Mozambique collided with a four-tonne truck and dragged it down the tracks, leaving dismembered bodies in its wake in what rescue officials described as a gruesome scene. The accident occurred shortly before 7:30 am (0530GMT) near the town of Malelane in the eastern province of Mpumalanga, south of the famed Kruger National Park. Earlier an emergency official said the toll stood at 20, with 19 dying on the scene and one more later in hospital. “As far as I know this is the worst rail accident in our region since 1994,” said Joseph Mabuza, spokesman for the provincial department of community safety. The truck was carrying more than 40 farm workers and two dozen of them suffered severe injuries. Some were airlifted to hospitals, with the death toll initially estimated at 30. “It would appear as if the truck driver may have crossed the railway line without having a proper look-out and as a result the train hit him and then pulled him for about a kilometre to two kilometres,” said Thulani Sibuyi, head of the province’s community safety department. The driver of the truck survived the crash. “It is understood that a coal train consisting of four locomotives and 39 wagons… collided with a four-tonne truck,” said Sibongiseni Hena, the spokesman for the railway safety regulator. Police said the driver had been detained and would likely face a charge of culpable homicide. Railways and freight rail in South Africa are owned and operated by Transnet, the state-run transport and logistics company. The firm said in a statement that the driver of the truck had failed to stop at a level crossing. The Congress of South African Trade Unions (Cosatu), the country’s largest labour federation, said the accident exposed the terrible labour conditions where “workers are transported in open trucks”. “The accident also points to the need to re-examine all railway level crossings to make sure that drivers are fully aware of the approaching hazard,” it said in a statement. 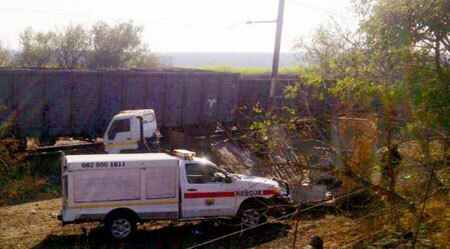 Accidents at level crossings are common in South Africa as drivers often ignore safety signs.